Since the early fourteenth century, travelers have journeyed to the resplendent island of Sri Lanka once known as Ceylon believing it to be just short of paradise. In 2001, centuries after the arrivals and departures of Dutch admirals, Portuguese soldiers, Arab traders, and British tea planters, Adele Barker and her son Noah came from Tucson, Arizona, to the island. Settling into its verdant central highlands, they would spend the next year immersing themselves in the customs, cultures, and landscapes of Sri Lanka-its elephants, birds, and monkeys; its hot curries and sweet mangoes; the cacophony of its markets; the resonant evening chants from its temples. They would also encounter there a world infused with the religious traditions of Buddhism, Hinduism, Islam, and missionary Christianity-and with the troubled history of sectarian violence that had culminated in a twenty-five-year civil war. Missing neither the nuances of the peaceful Buddhist pace of life nor the explosive violence of civil war, Barker offers an eye-opening account of the “pearl” of the Indian Ocean, inviting American readers to experience firsthand the vivid beauty and turmoil of a place few have ever visited. "Not Quite Paradise, published by Beacon Press, offers an eye-opening account of the "pearl of the Indian Ocean, including Barker's life as a professor at the University of Peradeniya in Kandy, Sri Lanka." 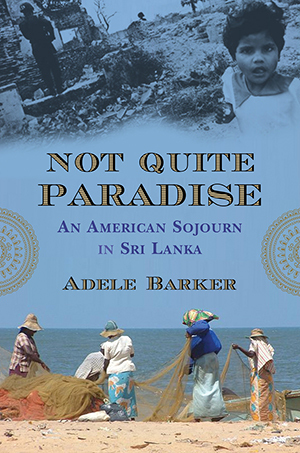 "Rich in the tales of Sri Lanka under colonial British rule as well as coverage of the current civil war, Barker’s memoir is an enlightening and captivating read." Weaving together reporting, travelogue, and personal narrative, debut author Adele Barker brings American readers with her to experience Sri Lanka, "the resplendent island" that seems to hang like a teardrop from the tip of India. Barker's account of the year and a half she spent living and teaching there moves deftly from the daily, personal details of Sri Lankan life and culture to reports on the war between the government and the Tamil Tigers, and the 2004 tsunami in which forty-eight thousand Sri Lankans died in the space of twenty minutes. Life on the island is complex for a Westerner, and Barker does not miss any of the nuances: the beauty and the bugs; the peaceful, Buddhist pace of life; and the explosive ravages of civil war. Barker acquaints us with the history of the place, the literature, and the traditions of Buddhism, Hinduism, missionary Christianity, and ancient myths. Not Quite Paradise offers a comprehensive, eye-opening account of the "pearl" of the Indian Ocean and a rare perspective on the massive devastation of the tsunami of December 26, 2004. Adele Barker, who was awarded a Ucross Fellowship for her work on this book, has taught at the universities of Arizona and Washington. She is the author and editor of five books on Russian literature and cultural life. Most recently, she received a Fulbright Senior Scholar grant to teach and write in Sri Lanka. Early on in her sojourn to Sri Lanka, Adele Barker expresses discomfort about hiring a housekeeper because she does not want to be "British and colonial" (p. 19). But for the applicant, the job is a lifeline. Do you think Adele is right that it is better and more principled not to hire a Sri Lankan housekeeper? Even if this might mean putting someone out of a job? Adele tells us of the engagement of a Sinhalese Buddhist, Atulya, and a Hindu Tamil, Gopi, in which neither ethnicity nor religion is an issue for the partners or their families and friends. One friend says, "I don't know how all of this got started, this ethnic superiority mess" (p. 81). How do you think it got started? What do you think perpetuates the ethnic conflict? And how is it that some Sri Lankans seem immune to these prejudices? If one wants something done, one is better off hiring a Tamil" (p. 118). How does that statement compare to racism toward ethnic groups here in the U.S.? Are there differences between Sri Lankan and American prejudices, in terms of content or explicitness? As she begins to settle into her new environs, Adele thinks of "the ebb and flow of one's deeply rooted beliefs and practices [and] how over time they slowly begin to merge with the belief system of the world in which one happens to be living" (p. 65). Do you think it is true that a foreigner can assimilate to another culture in this way, taking on its deeply rooted beliefs? What would make assimilation easier? Do you think there would be strong internal and external barriers? Jon asks Adele, "Is your life more real because you take a tuk-tuk? Is it better because you live with ants?" And she replies, "In a way, yes" (p. 95). Do you think Adele's refusal to take advantage of the western luxuries afforded by her relative wealth gives her a more authentic experience of Sri Lankan culture? What is an "authentic version" of a culture? Is this a romanticized notion? Is Adele's concept of "Colonialist Torpor" (Chapter 9) valid? What do you make of her foray into the British expat community, attending the Saturday night social at the Citadel (pp. 115116)? Is she being fair to the other westerners sojourning with her? Consider Adele's conclusion that, "The U.S. government has shown little interest in the war, partially because the island poses no security threat to us and exports no products we rely on" (p. 83). Should the U.S. provide military intervention in foreign conflicts when our national interests or those of our close allies are not threatened? Was the U.S. wrong to stay out of the Sri Lankan civil war? Are there other recent conflicts where the U.S. should have acted differently (the Balkans, Rwanda, Iraq, Afghanistan)? When Adele speaks with a local Tamil in Jaffna, he defends the Tigers as being "very strict" and the ones who actually keep the order (p. 247). And when she mentions Prabhakaran's kidnapping children for his army, another man disagrees and blames the splinter group of Tigers run by a man named Karuna for these abductions (p. 251). With such contradicting information and the sensationalized media coverage on both sides, do you think it is possible to get accurate information about the conflict? Would the government provide accurate information, in your opinion? Adele realizes that the Civil War is not so black and white; many strongly sympathize with the Tamil Tiger cause, yet they adamantly disagree with Prabhakaran's tactics; most in the north are not in the LTTE, though they have deep connections to the Tigers (p. 259). Yet outsiders, such as the U.S., have no reservations about labeling the Tigers a terrorist group. Is it possible to view civil war abroad in shades of gray rather than black and white? Does Adele's book help you to see the shading? What do you think of the Tigers? Adele Barker discovers that, "There was just no warning system in place that could warn the Sri Lankan population that a tsunami was on the way" (p. 201). Why do you think there was no proper, functioning warning system in place in the Indian Ocean? Do you think the international community has an obligation to provide developing countries with the proper warning systems to prevent tragedies like the astronomical death toll of the tsunami? Or should their own governments do so? Adele's friend Alan sends her a letter explaining that "three days later foreign aid just hasn't turned up yet, even in the highly publicized places like Galle. The only aid that has been getting through so far is through locals" (p. 158). Were you surprised to learn how slowly and halfheartedly foreign countries responded to the tsunami? And what about the Sri Lankan government? Do you think the government is in any way justified in selecting areas to rebuild based on economic factors, such as tourism, or is this fundamentally unjust? Adele hears numerous stories about international aid organizations that have been ineffective. An Austrian firm, for example, constructed a boat factory in Unawatuna, where the people do not earn their living from fishing, but from tourism (p. 186); foreign aid organizations continued to send fishermen boats when they desperately needed nets and materials for building houses were scarce (p. 171). Why do you think so many international organizations failed to deliver appropriate aid? Do you think Jake is right that this failure was the result of a "charity competition" (p. 185)? Adele encountered quite a few obstacles teaching in Sri Lanka. Besides the violence surrounding elections that kept students at home, she had to schedule class around poya and numerous other Sri Lankan holidays (p. 14). In Jaffna, Adele cannot obtain even one copy of Crime and Punishment, and is forced to teach Dostoyevsky without the text (p. 264). Could you imagine teaching a text without the book? Do you think it was successful? were given form centuries before I ever set foot here. Differences had been deeply etched since the first Europeans" (p. 290). Do you agree with Adele's conclusion that she was just as much an outsider to Sri Lankan culture at the end of her sojourn as she was at the beginning? Would that always be true, or can one fully assimilate to another culture? What do you think of the Sri Lankans' relationship with the natural world? Do you think there is something valuable about their acceptance of naturetheir cohabitation with monkeys, vines, and elephants, for examplethat we in the U.S. lack? it's just me and my son" (p. 13). How does the primacy on relationships in Sri Lankan culture compare to the value placed on personal relationships in American culture? When discussing Dostoyevsky with her students in Jaffna, Adele observes that the idea of isolation is alien to them because "people live in groups here or they live in extended families" (p. 268). And yet, Sri Lanka has one of the highest suicide rates in the world. Do you think the idea of isolation is truly unknown in Sri Lankan culture? Is it possible that some cultures may simply have no concept of isolation? In Sri Lanka, Buddhists take up arms in the war, which Adele remarks counters "the Buddhism I think I know from the peace movements in the United States in the 1960s and 1970s" (p. 54). How do you think practicing Buddhists justify using violence to achieve their ends? Is their use of violence hypocritical, or a "necessary evil" in a war-torn country? Through the poetry of Emily Dickinson, someone "who never knew war, never had her house bombed, and never, ever moved," Adele is able to connect with her students in Jaffna. She calls it "one of the finer mysteries of literature" (p. 277) that it can connect people from vastly different walks of life. Do you think this is a true statement? Why or why not? Doniger, Wendy. The Hindus: An Alternative History. New York: Penguin, 2009. Flood, Gavin. An Introduction to Hinduism. Cambridge: Cambridge University Press, 1996. Gunesekera, Romesh. Heaven's Edge. New York: Grove Press, 2004. ______Monkfish Moon. New Delhi: Penguin India, 1992. Halpe, Ashley, Em.E. Nukaman and Ranjini Obeyesekere, eds. A Lankan Mosaic. Colombo: Three Wheeler Press, 2002. Lopez, Donald S. The Story of Buddhism: A Concise Guide to its History and Teachings. San Francisco: Harper, 2001. Ondaatje, Michael. Anil's Ghost. New York: Vintage, 2001. Rahula, Walpola Sri. What the Buddha Taught. New York: Grove Press, 1974. Selvaduri, Shyam. Cinnamon Gardens. London: Anchor, 1999. Sivanandan, A. When Memory Dies. London: Arcadia Books, 1997. Subramanian, Nirupama. Sri Lanka: Voices from a War Zone. New Delhi: Viking Penguin, 2005.